OAKLAND CITY COUNCIL | A proposal by Oakland Councilmember Desley Brooks to create a new city department on race and equity will be part of the city’s likely contentious budget process set to begin in early May. Brooks pulled the plan from a vote by the Oakland City Council Life Enrichment Committee last Tuesday and instead, successfully motioned the proposed Department of Race and Equity be discussed during the yet-unscheduled first budget hearing in May. Oakland Mayor Libby Schaaf plans to unveil her budget proposal on April 30. The reason for the change in tactics? Brooks said she didn’t have the votes for passing the proposal to the full council on Mar. 31. “I understand how to count votes. I understand how to move items forward. I’ve been here long enough that I’ve learned some things,” said Brooks. “I’ve used the process as far as I can take it right now.” Discussing the proposal within the context of budget negotiations, at this point, is a better strategy, she added. A city staff report estimates the cost of running the new department, consisting of three employees and operating expenses, is around $520,000 annually. King County, Washington, which includes Seattle, and Portland have similar city departments entrusted with monitoring inequities surrounding race, age and the poor. Even though every member of the Life Enrichment Committee voiced strong support for ridding Oakland of the racial and economic disparities that exist, a few were skeptical. 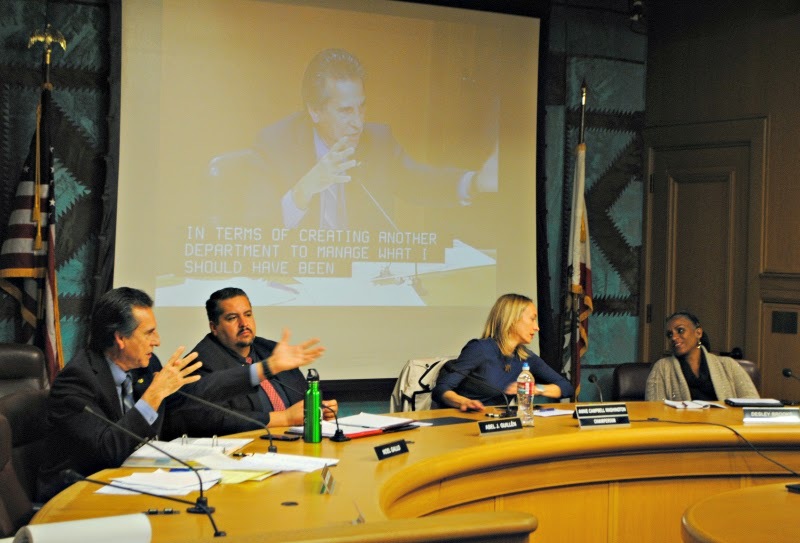 Councilmember Noel Gallo, the only committee member to vote against moving the item to the budget process, agreed with the underlining reasons for the new department, but opposed additional bureaucracy. Five governmental bodies already provide some of the services detailed in Brooks’ proposal, said Gallo. A brief give-and-take between Brooks and Gallo ensued with both poised to rebut each other’s statements. The tone was set by an earlier statement by Brooks asserting the council’s two Latinos—Gallo and Guillen—were not on board with her plan. “It amazing that I can sit on a panel with other people of color and they just don’t get it,” said Brooks. In the coming months, the Oakland City Council will likely juggle a large budget deficit while also negotiating with all nine of its public employees unions. Carving out more than $520,000 a year for a new city bureaucracy may be an uphill battle, despite the city administrator’s office showing support for the plan. There’s also question whether Brooks can cobble together enough votes for the proposal to pass. Posted in Abel Guillen, Anne Campbell Washington, budget, Department of Race and Equity, Desley Brooks, Life Enrichment Committee, Noel Gallo, Oakland, Oakland City Council, Portland, Seattle. Bookmark the permalink. Good description of our City Council at its usual high level of dysfunction. Leadership means: Having a clear vision for Oakland as a whole with an appropriate list of priorities and a corresponding system of outcomes measurement. Yes, Oakland's electeds all want to do something good. But none of them has the slightest idea how to proceed. Thanks for keeping us up-to-date on the same-old-thing.